Having extolled the virtues of bitter greens, I am now moving on to the benefits of slow food. LIke most people, I don’t look forward to hours at the kitchen counter after a busy day, so I don’t mean food that requires long and complicated preparation, but rather food that takes care of itself simmering away on a slow burner for hours, filling the place with mouth-watering fragrance. Specifically, I am talking about stock or broth and tomato sauce. Two things have driven me to embrace slow food, diminishing financial resources and health concerns. The kind of restaurants I can afford, now, don’t serve the quality of food that I want to eat. Excellent organic fresh produce and meat prepared in an appetizing way comes with a high price sticker if I eat out, but I got sick of the plain food I used to make before I took up slow-cooking stock. In addition, I have health challenges including a weak digestion and a tendency to osteoporosis. 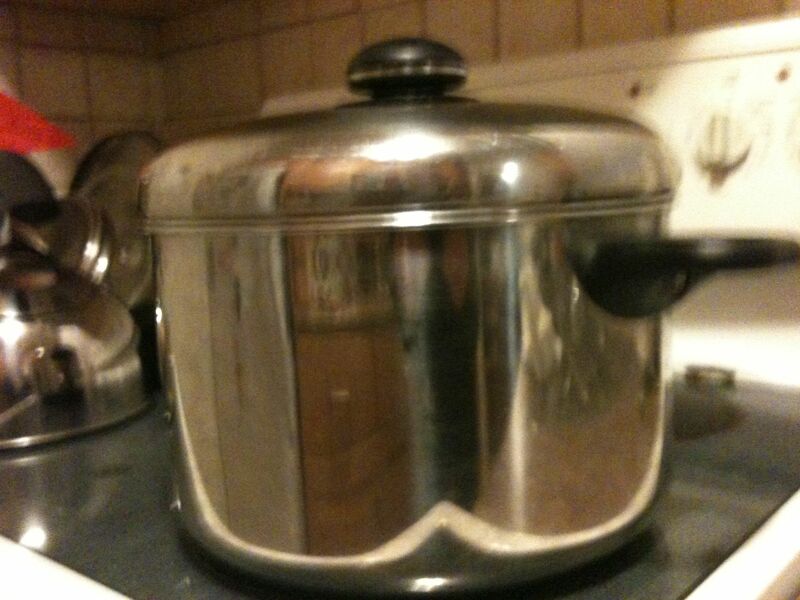 Earlier, in “Helpless Human versus Pressure Cooker” posted on May 22, 2012, 115journals.com I alluded to the fact that I cook brown rice in an Ohsawa pot set into a pressure cooker. I soak the rice overnight and cook it for 50 minutes. Doing so, makes it easier for my system to digest it. I also soak the rice farina that I cook for breakfast and I have it on good authority that soaking steel-cut oats for 24 hours prior to cooking them for breakfast renders them as delicious as croissants. With or without butter and jam, I’m not sure. I have cooked my rice that way for years and I can make it more or less sticky by adjusting the amount of water, although I tend to use the usual twice as much water as rice, a stickier option. It was only when I disagreed with my doctor about the significance of bone density scores that I turned to bone soup. (I have not broken a bone in 3/4 of a century and surely this says something about the strength of my bones; moreover, the medication would be entirely indigestible for my tum-tum.) Bone soup is an interesting name. I lived once in a sort of commune that served bone soup every Friday night, calling it a light supper. It was light all right. You could see through it. By the time, you had extracted the chicken bones, you were left with little more that broth with a few pieces of carrot and rice noodles. I soon learned to jump in the car and head out for the nearest burger joint that night. That’s not what I mean. I’m talking about beef or chicken stock made by roasting bones with as much marrow as possible and then stewing them gently with vegetables for at least 6 hours. It takes less than half an hour to prepare the ingredients, 40 minutes to roast them, a few minutes to transfer them to a stock pot. Once the burner under the stock pot is turned down to its lowest setting, it doesn’t have to be tended and the only other time needed is the washing up and transfer to containers for freezing. I use a pyrex type of small container and stack them in my small freezer. 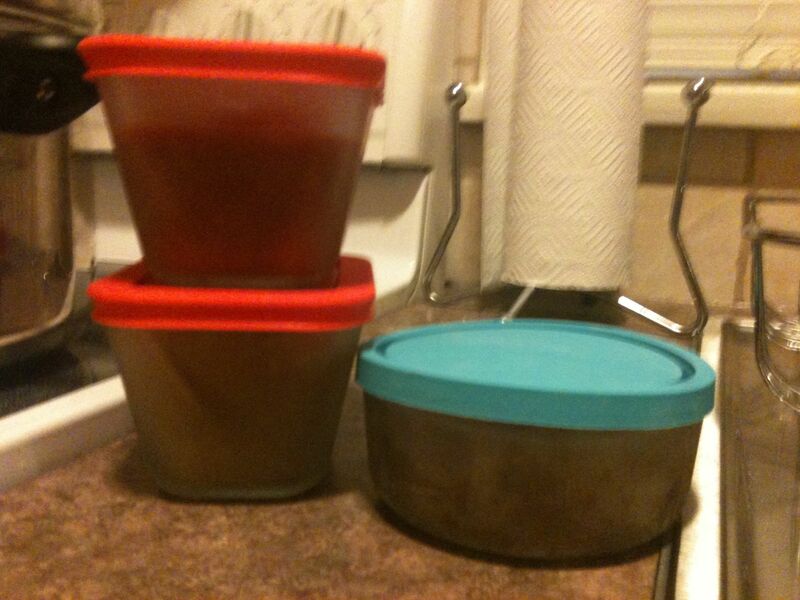 If I plan ahead, I take one out and thaw it in the refrigerator for 24 hours before I make stew or soup or gravy. If I forget, I put the frozen container in a pan of cold water so that I can pry it out in a hour or so and finish thawing in a pan on the stove. I can put together chicken soup from left-over chicken, thinly sliced carrots, green beans or chard and pre-cooked rice in about 15 minutes. I found inspiration online and in The Joy of Cooking, but I adjusted the recipes I found to suit me. I don’t use onion, for example, just carrots and celery. I do use good quality bones – beef, marrow bones, for example, with ox tails sometimes and always some chicken bones even in the beef stock or chicken backs with a few thighs, perhaps for substance. I roast all the ingredients at 400 degrees F. I roast the vegetables for the last half hour. This gives my smoke alarm a workout unless I remember to relocate it temporarily. I use much longer cooking times – 6 hrs.- than The Joy of Cooking suggests. I got hooked on the idea of roasting bones, years ago, when my first (although not then) son-in-law arrived from NYC and sought to woo me to his cause by roasting bones and making a reduction. He made a delicious meal and won me over. Thanks P.
I also make a vegetarian stock for when I cook for friends who don’t eat meat. Then I do use onion and a whole bulb of garlic. I found a recipe at allrecipes.com and have cooked it twice, both times enjoying how great it smelled and how great it tasted in a vegetarian Irish stew made of course with stout. (Sam Smith’s is vegetarian.) I found such a recipe by Melissa Breyer online www.care2.com. I t uses root vegetables including carrots, parsley, parsnips and turnips as well of course as potatoes and pearl barley, all in the previously slow-cooked vegetable stock. The stew itself takes only an hour or so, but be sure to get the barley well-cooked, not crunchy. Recently a huge pot of this stew went over very well at a potluck lunch. It was a stick-to-your-vegan-ribs sort of meal. The other thing I love to slow cook is tomato sauce, not exactly a novel idea, I know. But I couldn’t eat tomatoes at all until I was told by that same good authority who soaks oats for a day that if I cooked them many hours I maybe could. I opted for 6, just for consistency. I simmer 4 or more cut up pounds that long until they are more or less paste and puree the result. Once again I freeze the paste and I can make a tomato sauce from it in a few minutes. I can’t use much and I still find it challenging to digest but it adds flavour and interest to my diet a few times a month. So there you have my ideas for slow food, which miraculously turns into fast food, which tastes as good as gourmet restaurant food and which keeps me healthy. This entry was posted in cooking, health, humor and tagged beef broth, beef stock, chicken soup, chicken stock, pressure cooking brown rice, rice farina, roasting bones, slow cooking, slow food, steel-cut oats, vegetable Irish stew, vegetarian stock, weak digestion by joyceahowe/hood. Bookmark the permalink.